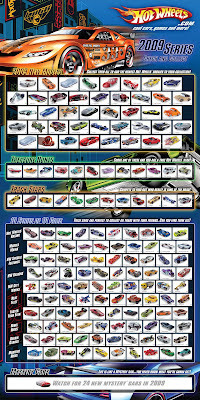 This year Hot Wheels comes with 190 models in the series. There are more new and interesting models coming up to keep us excited. Besides the Mystery Cars, I do hope the wave could cover everything in the list, do keep our fingers crossed and your pocket loaded. I have highlighted some models that I looking forward to extend my collections. The line consists of 42 New Models, 12 Treasure Hunts, 12 Track Stars, 24 Mystery Cars, and 10 Segment Series of 10 cars each. The Segment Series in 2009 are Hot Wheels Racing, Muscle Mania, HW Special Features, HW Designs, HW City Works, Heat Fleet, Faster Than Ever, Rebel Rides, Dream Garage, and Modified Rides. I've got these at hands..hehe..